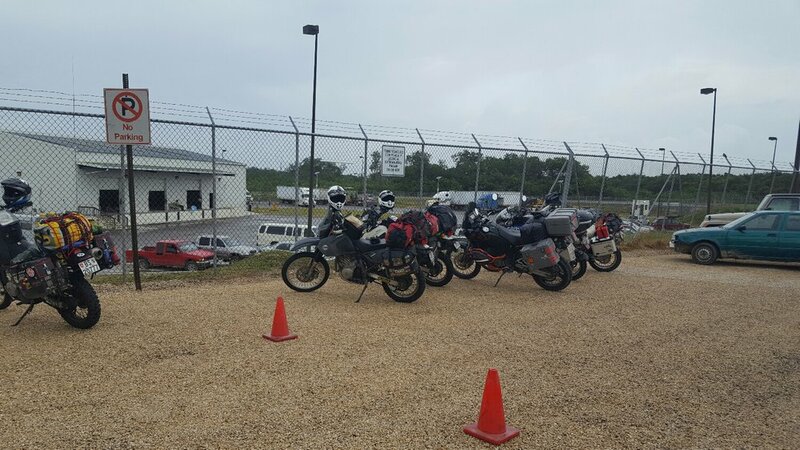 Motorcycle parking at Belize customs. "Welcome to Belize", I can't count the number of times I heard that this morning. I'm not sure if it was the shear volume of people who said that to me or if it was because it was said in English, but I truly felt welcome. Today we left Tulum before sunrise (I know crazy right?!) to make it to Unitedville belize before the sun slipped below the horizon. Dom was feeling ill from something he ate last night. I could tell from his voice that he was clearly having type 3 fun (which is no fun at all). We made it to the Mexico-Belize border before 11 am est. 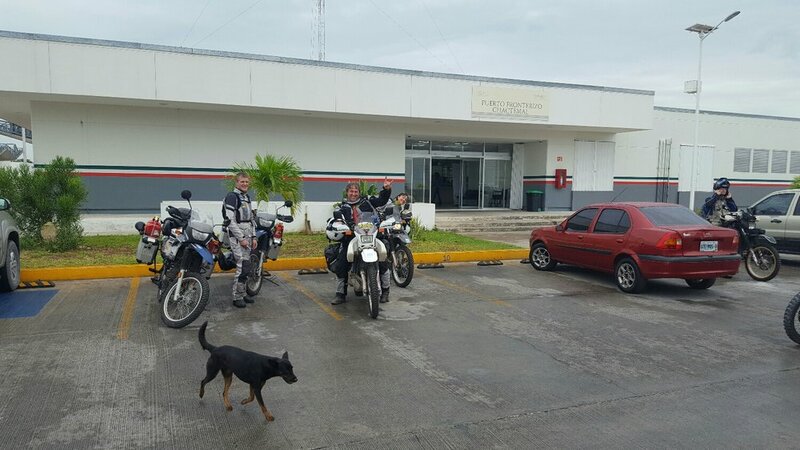 At Mexico customs we were shocked to see 4 other "overlanders" on motorcycles. "Overlanding is self-reliant overland travel to remote destinations where the journey is the principal goal" (Wikipedia). We would be considered overlanders, in the states we just call it adventure motorcycling. However, next to these four seasoned veterans we were amateurs. Their suzuki DRs and KTM adventurer were kitted out to the point where they were barely recognizable. Three of them were from South Africa, they made the trip up through Africa, across Europe and down from Canada. They had been on the road for 7 months this time. The fourth was from Canada, and he joined them for the North and Central America leg with plans to proceed on to Africa next. As we marveled at their ease of navigating through red tape at the border and their well thought out set up, we realized how green we are to this hobby, nay life style. I couldn't help but wonder how do they do it? How can they afford it? Someday I would love to be able to travel on a motorcycle indefinitely. They were full of great advice and extremely helpful, it's odd that four complete strangers could be my new role models. Fellow Nevadans at the Mexico-Belize border. While discussing our respective journeys at the fumigation station, a Honda with a side car rolled up. One of the South Africans exclaimed, "what is this bike day at the border!". While paying for my fumigation I heard that the couple in the side car were from Nevada! I had to introduce myself and soon found out they were from Carson City a mere hour from my hometown! I never really bought into the expression "it's a small world", until that moment today. 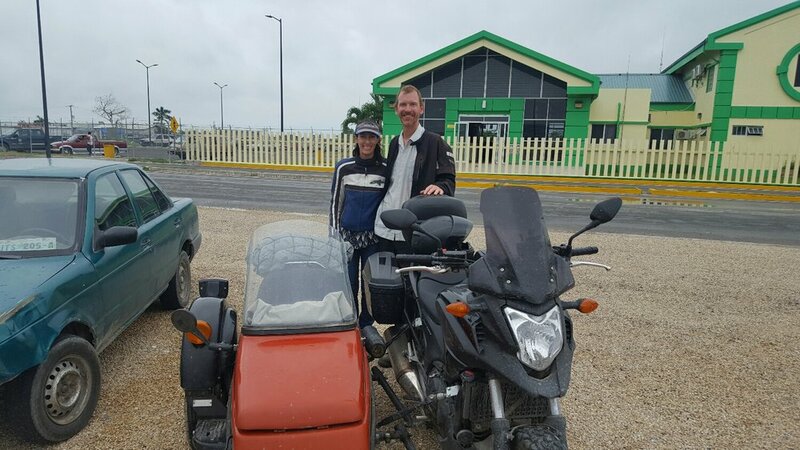 Somehow of all the days and times to arrive at a border in all the countries of the world I run into two Nevadans crossing the border into belize on a motorcycle at the same time as me. After navigating all of the beauracracy (we basically followed the pros around). We made it to Belize the process was so much smoother than going into Mexico. Belize has two major highways the "northern" and the "western". We drove across most of both today. Roads in Mexico were rough but they felt like they still could have been really bad US roads. The roads in belize were relatively well paved but, thats where the comfort ended. There are virtually zero signs on the roads (no mileage markers, city signs, street signs, nothing for navigational reference except friendly locals pointing). The roads are about the size and quality of a quiet country road and there are topes except English is spoken here so they just call them "bumps". Without knowing it we strayed off the Northern Highway onto a soft muddy road. We thought maybe this is the way roads are here. After only five minutes the white, slippery, slimey, muck filled all the grooves in my tires and I went over. It was only then that the thought crossed our minds that maybe we missed an un-marked turn. 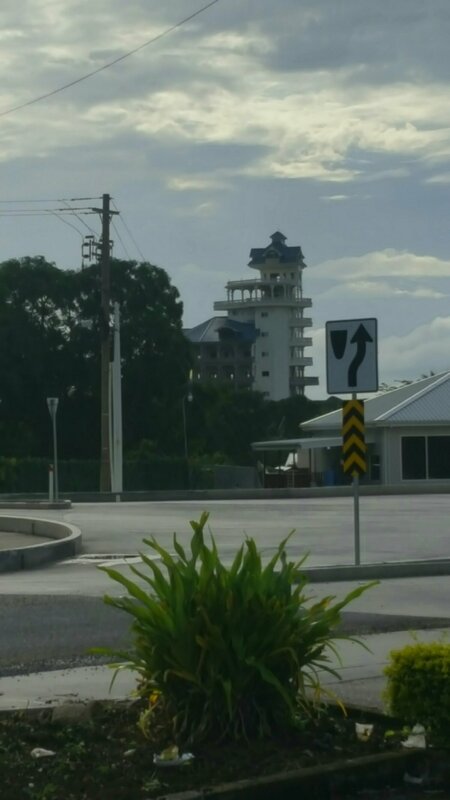 The tallest building in Belmopan, the capital of Belize, is a bit odd. We eventually made it to Belmopan, the capital of belize. I was surprised by how small the capital was. There was no real urban development and no buildings larger than 3 or 4 stories (except the one pictured). It also seemed odd that it was the main road going through this part of the country (the western road) didn't pass through Belmopan. Our hostel in the middle of the jungle wasn't far from Belmopan and I am settled in for the night tomorrow we'll be in Tikal Guatemala.